Year 2 pupils at Governor’s Meadow First School held a History Day on Castles this week. History Day engages pupils by making their learning on a topic relevant, fun and exciting. The work, led by the Year 2 Coordinator Mrs Chichon and her team, is a part of a wider academic enrichment program for pupils that aims to bring their learning to life, and provided a culmination to pupils’ in depth learning and research on the topic. 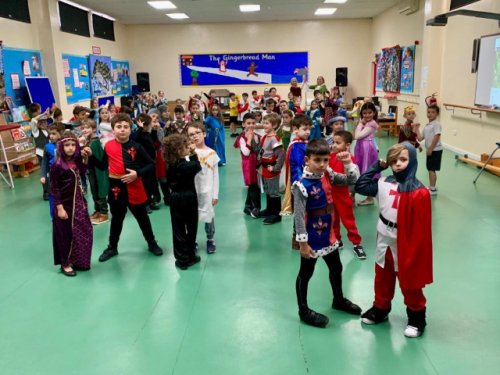 Pupils and staff dressed up as castle and medieval characters for the day such as princes, princesses, knights and jesters. They were involved in a variety of hands on, fun and educational activities including crown making, medieval song and dance and they participated in a Knight’s Target Practice. The successful event helped to enrich pupils’ understanding and appreciation of life, as well as hardships, during this period in history, whilst also helping to develop 21st Century skills in pupils.